As announced in the June 5th City Journal, Ray of Light Childcare (the link goes to their facebook page; the website is not up yet) has received their zoning permit at 6836 Fyler to begin providing daycare service for up to 4 children. Congratulations! I'm very glad to see residents providing needed community services. Alderman Joe Vaccaro posted this morning (June 8th) to the closed LPNA facebook group, that Circle K will again begin the process of purchasing and rezoning the residential unit adjacent to the existing property with the intent of building a massive facility in its place. Per his post (see image), there will be a meeting held in Timothy Lutheran Church (6704 Fyler Ave, 63139) on June 18th at 6:30pm. Lindenwood Park Neighborhood Association President Janet Desnoyer began the evening promptly at 7:30pm by thanking Annette Bridges, the Neighborhood Improvement Specialist for Ward 23 who will be retiring this month after six years of service. Vaccaro (23rd Ward Alderman) and Kratky (82nd Districted State Representative) presented both city and state proclamations for her dedication and service. Alderman Vaccaro spoke to the gathering about a December 16th court date for a person of interest who has been charged with several burglaries and drug volations over a significant period of time. He (and later Officer Stehlin) said he would be asking for neighbors to write letters and/or attend the date to show that the neighborhood is interested in seeing the law enforced. Alderman Vaccaro also said that Chick-Fil-A will be moving into what is currently For Your Entertainment (FYE) on Hampton. He then answered questions and concerns from the audience including a concern on the negative impact of potential tax breaks for developments related to Ballpark Village, a new professional soccer team interested in moving to St. Louis, and the Scott Trade center. Another attendee asked about speed bumps and traffic calming measures that were discussed several months previous. Vaccaro said that research is still being conducted but Lindenwood Park should start to see some of those traffic calming measures implemented in the Summer of 2017. Darlene Green, Comptroller for the City of St. Louis then spoke briefly on the Green HELP home energy-efficiency loan program her department is currently managing. 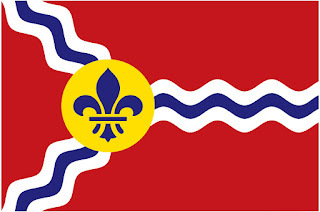 For more information and/or to apply visit https://www.greenhelpstlouis.com/. After a few LPNA committee reports, Public Safety Officer Vince Stehlin spoke about a number of items. First, the suspect for the armed robbery committed at the Circle Kat Jamieson and Fyler on Nov. 26th is still at large. SLMPD have a few leads and are perusing them. Officer Stehlin sympathized with neighbors who were concerned that crime reports aren’t always made public (such as the armed robbery of Sep 7th which also took place at the Circle K at Jamieson and Fyler, but was never publicly reported), but that sometimes his superiors make him withhold information when releasing it may contaminate the investigation. Officer Stehlin also announced that the trio who had been shooting windows out of cars all over St. Louis city and county for a number of months have finally been apprehended. On Wed. Dec 7th from 8a to 10a, Chris’s Pancake and Dining (5980 Southwest Ave, St. Louis, MO 63139) will be hosting the next Coffee with a Cop event. Next, he stressed that the most frequent crime in Ward 23 is petty larceny. He cautioned people against leaving their cars and garages unlocked, against leaving their vehicles unattended when they are warming them up in the morning, and when expecting packages to take steps to be present when deliveries occur or arranging for someone to pick up their packages. An unattended package or an unattended running car is an invitation for theft. 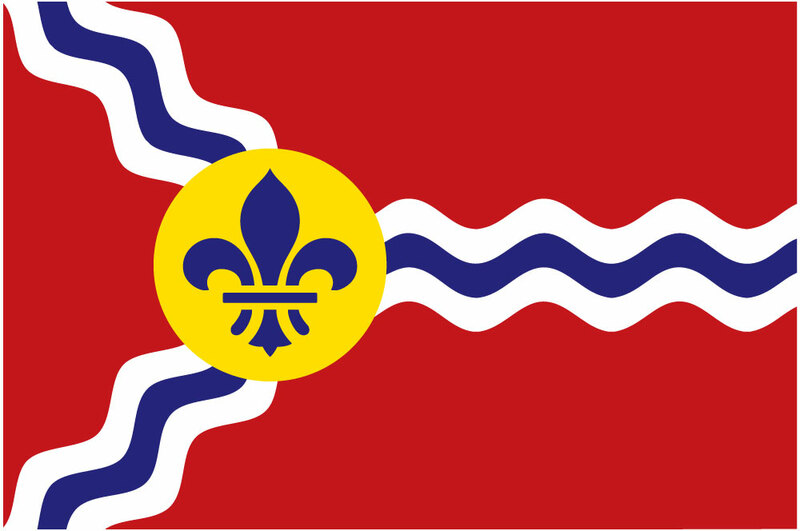 Then, he pointed out a concern the SLMPD has been having with the frequency of calls to commercial entities. These calls use valuable time and resources, and potentially delay responses to resident emergencies. To emphasis the point, he issued a handout that revealed 873 calls for service in 2016 to six Walgreens stores in and around our neighborhood. The Walgreens at 3920 Hampton carried the bulk of the calls with 352. Not all of these were superfluous, but enough were that the Police Department is trying to leverage Walgreens to provide their own security. In opening questions from the floor, an attendee asked about the new gun laws that are due to go into effect January 1. Officer Stehlin replied that he was genuinely concerned about the new gun laws, but the state is still trying to finalize what they will be. Until then, we can only stay tuned. Officer Stehlin thanked everyone for the words of support and concern for Sergeant Lake who had been shot while on duty in the Lindenwood Park neighborhood. Finally, he encouraged people to signup for his email alerts (send your request to vstehlin@slmpd.org) and also encouraged people to reach out to Captain Deeba at madeeba@slmpd.org with police-related questions or concerns. On Wed, Dec 14th from noon to 6pm, the SLPL Machacek Branch will also be hosting a holiday open house with light refreshments, and storytelling and crafts for kids. Janet then closed the meeting at 15 minutes to 9pm. Hearing No. 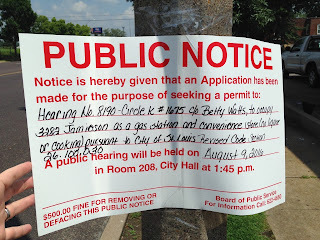 8190 - Circle K #1675 c/o Betty Watts, to occupy 3282 Jamieson as a gas station and convenience store (no liquor or cooking) pursuant to City of St. Louis Revised Code Section 26.100.030. Source: City Journal v.99 issue 18, page 17. Excise notified us this morning that the liquor application for Mac's Convenience Stores LLC, doing business as Circle K, located at 3282 Jamieson, has been closed out. Circle K had until June 13th to turn in petition signatures. As that lapsed, Excise issued a Delay Letter, notifying Circle K they had 10 days to respond or the application would be closed. This also went without response from Circle K.
What to do about the nearly chronic problems associated with Circle K’s business such as trash, loitering, light pollution, and traffic congestion. Although the Circle K liquor license issue served as the catalyst for forming this site, there is an ongoing need to have a website and resource that serves the property owners, residents, and business occupants around Jamieson and Fyler. To that end, if you own, live, and/or work here, I'd like your feedback on what you currently see as your biggest challenge being here. Please either post in the comments section of this webpost, or if you want to remain private, email me at sethmd73@gmail.com. I look forward to hearing from you. 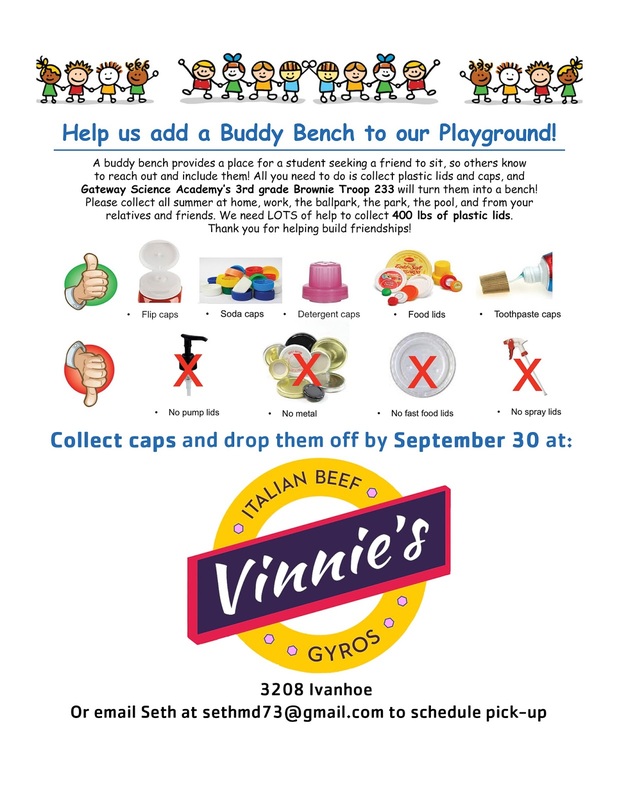 Gateway Science Academy's 3rd Grade Brownie Troop 233 is currently collecting plastic caps and lids to put a 'Buddy Bench' in their playground. They need lots of help to collect 400 pounds of plastic lids! The Troop has reached out to Matt, owner of Vinnie's @ 3208 Ivanhoe and he has generously agreed to serve as a drop-off point for caps. Please take them there or you can contact Seth at sethmd73@gmail.com to schedule a pick-up. Currently we are planning pick-ups in mid-July and the end of September. 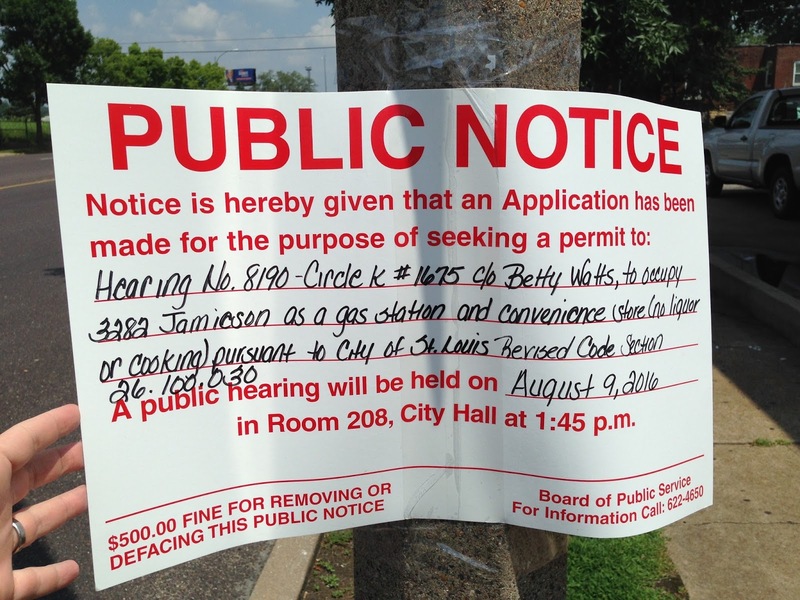 “Unless something radical changes,” Alderman Vaccaro said Monday night at the General Assembly of the Lindenwood Park Neighborhood Association, the Circle K’s application for liquor at their Jamieson and Fyler location will not have enough signatures to move forward. For those against liquor sales it is still too early to breath easy. Hurley&Hurley has until the end of the day Monday, June 13th to turn in petition signatures. After that, the current application lapses. In addition to those, in the weeks and months ahead I plan to re-position this website beyond this Circle K issue so that it may continue to serve the Jamieson and Fyler area as a resource for information, keeping our community strong and informed. All comments on this blog will be moderated. Please keep it civil or I'll yank them. If you want to vent somewhere, try Nextdoor. 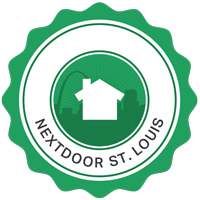 The City of St. Louis has adopted Nextdoor as THE social-networking site to keep residents informed and engaged. If you haven't joined, Enroll Today.